Many well-intentioned composters keep adding kitchen scraps to the compost bin and then wonder why they are left with a smelly rotting mess. The science of composting is all about getting the carbon/nitrogen ratio of the contents correct. Follow the correct principles and you will create superb compost suitable for enriching soil. What is the Carbon/Nitrogen Ratio? Good compost is a balance of different ingredients, but essentially it comes down to the all important, but often misunderstood, carbon/nitrogen ratio. So, what’s it all about? Well, let’s call carbon “Brown”, and nitrogen “Green”. We need a good balance of brown to green, generally 30 brown to 1 green. Sounds complicated I know… but it’s not. Brown materials include things like paper (the shredded Sunday paper minus the super glossy magazine bit is perfect), sawdust (from untreated timber only), dried leaves and oaten hay. 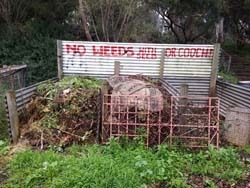 Green materials are things high in nitrogen, including lawn clippings, fresh manures (cow, sheep and chook only! ), vegetable scraps and (shudder) urine. The best way to get this right is to add one bucket of “Browns” for every bucket of “Greens”. So, when adding a bucket of silverbeet add in a bucket of shredded newspaper. Because of the different make up of these products, it gets the C/N ratio just right! If there is too much “Brown” the nitrogen in “Greens” will be locked up by microorganisms and be unavailable for subsequent plant growth. Potassium is also an important constituent of compost. 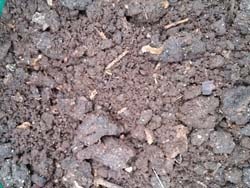 Although it is much more available to plants than either the carbon or nitrogen, its content can be reduced if the compost heap is open and subject to a lot of rain. This problem can be overcome by covering the heap as it approaches maturity. What ingredients go into good compost? contain both carbon & nitrogen, such as kitchen scraps, pea straw and green garden prunings. What else helps the composting process? warmth, by putting it in a sunny place unless you are using a purchased bin of some type and the instruction warn against it because of the risk of overheating. 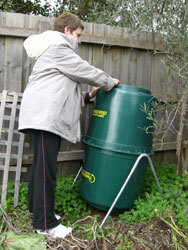 A compost bin does not need worms, but if they are present it may function more efficiently. Generally, a well functioning comport bin with an open base will become home to a host of delightful wormy creatures over time, a sign that your heap is doing well. Meat scraps and dairy products – yes, but they can present issues. They will decompose eventually, but will smell bad and attract pests. So avoid them unless you are using a well functioning, closed bottom compost bin. Fish bones – yes, but mix them through the heap, rather than leaving them on top. They can smell bad and attract undesirables… use with discretion! Office paper – no, if it has been bleached or is glossy. Old tyres – no… but they do make lovely decorative swan planters! 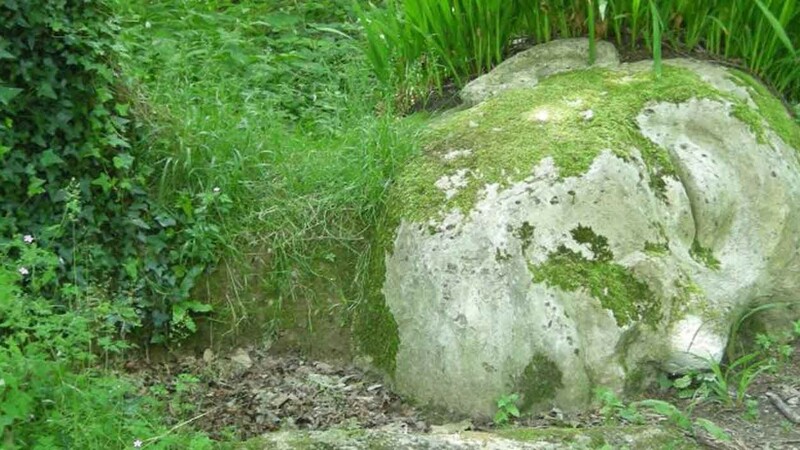 Weeds – yes, but be careful. If they are without seed heads, go for it. If they are have bulbs (such as oxalis) or spread on runners (like couch and kikuyu), they are to avoided. Bird, dog and cat poo – no… there is a significant risk of disease with pet poop, so don’t use it. Don’t even think about adding person poo! Tree branches – yes, shredded before adding, unless disease is present. Eucalyptus leaves – yes, but they may take a while to decompose so run over them with a lawn mower first. Lawn clippings – yes, but not in large quantities unless some dry matter is added at the same time, such as dried leaves or shredded newspaper. This helps prevent the clippings becoming a putrid, slimy mess. Remember, twelve buckets of lawn clippings need one bucket of sawdust, or three buckets of shredded newspaper to get the C/N ratio correct! C itrus fruit – no, these are highly acidic and may take a while to break down, and they can really slow down the composting process. Coffee grounds and tea bags – yes as long as the material making the bag is made from all natural materials free of plastic – the tiny staple on the tea-bag will eventually add a bit of iron to your soil. Take-away pizza cardboard containers – tear them up first and they act as carbon matter for the heap. Newspaper – yes, the better shredded the faster they will compost. Avoid the glossy inserts! Eggshells – yes, they are a wonderful addition, but decompose slowly, so should be crushed prior to popping in the bin. Diseased plants – no, this isn’t a great idea as it will perpetuate disease in your garden. Left with half-decomposed big lumps? Adding smaller pieces to the bin should ensure that it all decomposes evenly. Avoid avocado seeds, pineapple tops, twigs and other woody items unless they can be crushed or chopped before adding. Always crush eggshells. Well, that’s generally the smell of laziness (or anaerobic decomposition)… it means that the heap has not been turned adequately, and thus there is a serious shortage of air! Turn it now, for the good of the heap! And while you’re at it, put in some good, dry brown material, like sawdust, straw or leaves. That will soak up any excess water present in the heap. Crawling with ants and slaters? The heap is too dry. Add a sprinkling of water or put in less dry matter. Ants and slaters are not harmful at all but they do indicate that your compost will not decompose rapidly enough. If you get attacked by tiny flies (Drosophila) every time you open the lid, rest assured that they are there because they enjoy the contents of your bin, especially if you have been adding fruit peelings, such as apples or kiwi or pineapples. Add a blanket cover to the contents of your bin, such as hessian sacking, carpet felt underlay or thick newspaper. Plagued with rats, mice, blowflies or maggots? Meat scraps or fish bones can be added to the bin but only if it is working efficiently and quickly. They are best avoided since they do encourage vermin, especially over summer. Rats and mice enter the bin by digging underneath, so fasten a piece of chicken wire under the bin before commencing. Taking so long to do anything?!!! The carbon/nitrogen ratio needs to be altered. Remember: too wet, add dry matter, such as newspaper. Too dry, add water along with some high in nitrogen compost activator, such as blood & bone, pelleted organic fertiliser or chook poo. And don’t forget to regularly turn the heap over! Composting reduces the amount of waste we send to landfill. It’s also very good for the garden. Use compost as a soil conditioner. Compost may not always be beneficial as a straight plant food as the nitrogen content is easily lost, but addition of organic matter such as compost encourages worm activity in the soil and provides an excellent environment for soil microorganisms to do their work.